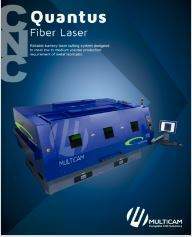 The Quantus Fiber Laser from MultiCam is the next generation in Laser Cutting systems. Quantus combines the precision of ball screw drives with the simplicity of our CNC controls and the latest fiber laser technologies. All this ensures the Quantus Fiber Laser is the most advanced, industrial grade and cost effective laser cutting system on the market. The Quantus was developed to provide high accuracy cutting capabilities, while maintaining the industry’s most energy efficient footprint. Engineered with a user-friendly CNC control interface, the Quantus ensures an easy integration into entry level manufacturing as well as high production environments. By using energy-efficient fiber laser, the Quantus achieves a level of quality and efficiency that is unprecedented for mid-level laser systems at any price. The Quantus is equipped with the latest ultra-efficient AIR COOLED Quasi-CW lasers with power levels starting at 1500 Watts* and going up to 3000 Watts*. The Quantus was designed to be compact and space saving, taking less room that traditional systems. In addition, to a host of available laser powers, the Quantus can also include a range of options from multi-table pallet changers to pipe and tube cutting attachments. The Quantus offers ultra-low power consumption, allowing for the lowest operating costs among all laser types. The Quantus requires no optical systems alignment, laser service or laser replacement parts making this system virtually maintenance free.